ABOUT THIS ITEM: The Partagas Coleccion Book 2013 is a Habanos S.A Collection release that comprises a special and unique production of only 2,000 individually numbered books. This is the thirteenth release since Habanos started the Book Collection Series back in 2001. Each book contains 20 perfectly constructed "Serie E No.1's". The Double Robustos vitola, is unique to the brand as it's not offered in any other regular production Partagas. Yet another Habanos exclusive release for collectors!!! Romeo y Julieta Fabulosos No.2 Collection Book released in 2016 as the 15th collectors edition of "Habanos Books"
About this Item: This first ever Habanos Gran Reserva enhances the unique character of Habanos as a “Denominacion de Origen Protegida” (protected Denomination of origin). > Presentation: 5.000 numbered cases with 15 units each. And last but not least, as we all know, this cigars has been rated 100/100 by James Suckling from CigarAficionado. 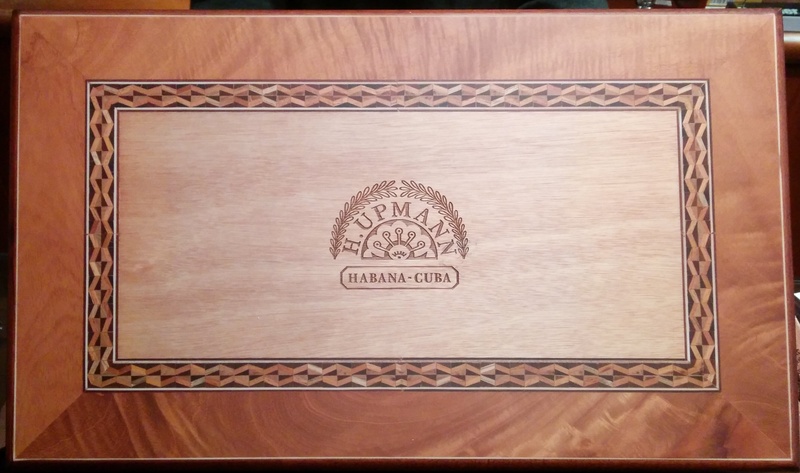 About this cigar: The H. Upmann Sir Winston Gran Reserva 2011 Cigar is a truly unique and highly coveted cigar. It's vitola, 'Churchill', is one of the most famous vitolas available, which takes its name after Winston Churchill who was hardly ever seen without a cigar. This very popular sized vitola measures 178mm in length by 47 ring gauge. These rare cigars have been hand rolled by the expert hands of Cuba's torcedors and the tobacco used in these Cuban cigars have been sourced from a crop cultivated in 2011. The tobacco leaves used have been grown in the Pinar del Rio province of Cuba, meaning these cigars are considered to be made from the very best tobacco farms in the world. This is the first time H. Upmann has been chosen for a Gran Reserva release, so enthusiasts of the brand are very excited about it. Every Gran Reserva cigar contains tobacco which has been aged for a minimum of five years and is then released only when there has been enough tobacco produced. This difference means the production of these cigars are not rushed and only the most premium tobaccos are used. The 20 Habanos in this exclusive edition, with a full-strength flavour, have been made Totalmente a Mano con Tripa Larga – Totally Handmade with Long Filler – after a selection of exquisite wrapper, filler and binder leaves from the finest fields – vegas in Vuelta Abajo* region (D.O.P.). The vitola Cohiba Majestuosos 1966 has special dimensions that aren't repeated either in any other Cohiba product nor in the standard range of sizes of Habanos. This is a very special product for enthusiasts both of the Cohiba brand as well as Habanos in general due to its new format, heavy ring gauge and exquisite full strength blend, which has been created for smokers who like complex intense flavours. The Habanos in this edition also features an exclusive and innovative presentation. In addition to the brand’s ring, these Habanos have a commemorative tape in black and gold, with the seal of the 50th anniversary and the dates ranging from its creation to the current year. This unique Cohiba Behike Humidor contains box of each Behike Linea. Beautifully crafted with special BHK key and 2 separate trays for your cigars. ABOUT THIS CIGAR: To celebrate the 25-year history of this prestigious network of La Casa Del Habano which has more than 140 branches all over the world, Habanos s.a. presented in 2015 a Humidor with an intriguing design. This artisanal piece of work that has been delicately carved in fine woods by the best Cuban artisans, has the shape of a colonial styled house with the colours that identify with its graphic image. Inside each humidor are two special edition sizes of the La Gloria Cubana blend, a Pirámides (6 1/10 x 52) and Robustos Extra (6 7/10 x 48). There are 15 of each cigar included in the humidor, with a total of 3,500 humidors produced and available exclusively through La Casa del Habano locations, which is reflected by way of the secondary band that the cigars wear. Each humidor was carved in fine woods by Cuban artisans in the shape of a colonial styled house, with colors that complement those of La Casa del Habano stores. ﻿About this Humidor: We are proud to present to you a replica of an ancient Montecristo Humidor, of which, only 350 humidors were produced in 2009. 50 Doble Coronas are housed inside this beautiful piece aimed for delightful Montecristo aficionados. These humidors are manufactured totally by hand and made from cedar and mahogany wood, by the renowned Cuban goldsmith Ernesto Aguilera who was also the artisan responsible for all the other Replicas Ancient Humidors made for La Casa Del Habanos (LCDH) since 2006. He is also the author of some unique masterpieces auctioned at the past editions of the Habanos Festivals. A highly collectible piece of cigar history and art. ABOUT THIS HUMIDOR: To commemorate the 500 anniversary of this beautiful city in Cuba, Cuban rum brand with the same name "Santiago de Cuba" has released a special edition of its dark rum. To pair this spectacular bottle of rum with a cigar, Angel Miranda (Cuban artist) with the approval of Partagas LCDH has taken the honors and made 50 humidors with 50 Partagas Series P No.2 cigars for this occasion. The Punch Supremos "Edicion Regional Suiza 2015" is an iconic masterpiece designed to look like a Cuban cigar press. This exclusive release comprises a special and unique production of 100 individually numbered humidors including 50 Punch Supremos Swiss Regional Production 2015 distributed in two draws. The bottom "third" draw includes an Adorini humidification system to ensure an optimized environment. This is no doubt a collector's item!!! To commemorate Hunters and Frankau Anniversary, they have commissioned two hundred and twenty-five, numbered replicas of antique cigar humidor each containing four boxes (100 cigars) of the Ramon Allones Hunters & Frankau Aniversario 225. Each humidor is delivered with a complimentary 50cl bottle of very special rum prepared by Havana Club’s master blender Asbel Morales to marry with the taste of the cigar. Also called the Hunters & Frankau Aniversario 225, we thank Havana Club for supporting our celebrations by producing 500 numbered bottles of this precious spirit from selected vintage casks. None will be for sale, but if they were, the value would be some £600 per bottle. After release of the Ramon Allones Perfectos in 2014 for Swiss market, Intertabak (Swiss importer of Cuban cigars) has released 100 humidors for this spectacular regional edition. This beautifully crafted humidor consist of 50 cigars. They have the old style Ramon Allones band (anilla) and come in Britanica vitola (shape). Only 100 humidors were made. Another rare item for cigar collectors. Regional edition for Italy. Limited edition of 180. To celebrate the 83rd birthday of Don Alejandro Robaina. ﻿About this Jar: This is an exclusive release celebrating Pacific Cigars 20th anniversary. It comprises a special and unique production of 1,020 individually numbered jars including 20 carefully selected robustos. This jar with matching ashtray is made of bone china and crafted with golden dragon motifs. Without a doubt, one of the finest Habanos release destined to the Asian Pacific Region. ABOUT THIS CIGAR: ﻿The H. Upmann Magnum 46 jar collection consists of 1,100 numbered units and each contains 19 cigars aged over 7 years in the best conditions of conservation, thus the layers become darker and silky, the taste is settled, and aroma, strength and body are dimmed. ABOUT THIS JAR: ﻿Production of these jars is limited to 860 pieces with each jar numbered. They have been released in 2014. Jar contains 19 x Hoyo de Monterrey Epicure No.1 cigars. Collector's item made for Spanish market. All the cigars in the jar have a minimum age of 7 years, they also have a second band of 'Colección Vintage' and old Hoyo de Monterrey band from before 2008. La Escepcion "Don Jose" is one of the vitolas that has been selected by Habanos in 2015 to offer exclusively to the Italian market. These "Don Jose" are manufactured with selected leaves from the world's best tobacco and comprise a special and unique production. Only 400 jars of 25 cigars have been made for this regional edition. This Montecristo Churchills Anejados has been introduced by Diadema S.P.A., the sole distributor of Habanos in Italy in 2018. It consists of 25 cigars which has been aged in Cuba for at least 7 to 9 years. Only 250 jars have been produced. Jar of 27 Montecristo no. 3 cigars. Limited to 2000 jars released in 2016. Cigars were aged for a minimum of 5 years. This wooden jar has been release specially for Partagas Casa del Habano in Havana,Cuba in 2015, commemorating 170 Anniversary of the Partagas cigar brand. The jar consists of 25 Lusitanias cigars with extra Aniversario band. Partagas 8-9-8 Coleccion Vintage has been released in 2015 for La Casa del Habano exclusive. It was produced in 800 numbered jars and specially made available to the Spanish market. For this vintage, is select the finest tobacco and has been aged for at least 5 years. ABOUT THIS CIGAR: ﻿The jar is limited to 2000 pieces with each having jar numbered released in 2016. Jar contains 19 x Punch Punch cigars. Collector's item made for Spanish market. ABOUT THIS CIGAR: The Reserva Series features different packaging and a black and silver band. This differentiates the cigars from there standard release as they only use tobaccos that have been aged a minimum of three years, with this particular release using tobaccos from 2012. Another difference from the standard release Epicure No. 2's is that the Hoyo and Epicure bands have been combined into 1 band, rather than 2 separate bands. The Hoyo de Monterrey Epicure No. 2 Reserva Coscheca was announced at the 2016 Festival del Habano and has had cigar aficionados eagerly waiting for the official release. Only 5,000 boxes of 20 cigars are released worldwide.